Sling Shot: Toronto captain Ted Kennedy on a call at Boston’s Hotel Sheraton Plaza on January 2, 1953, the day after his run-in with with Bruins’ counterpart Milt Schmidt. Milt Schmidt had his version of what happened, and the gist of it was this: not his fault. New Year’s Day, 1953, Toronto was in Boston. The Leafs ended up yielding to the Bruins by a score of 5-1. “A sprightly display,” one of the local papers decreed, despite a couple of “accidents.” The view from Toronto wasn’t so bright. “One of the most vicious games at the Garden in years,” The Toronto Daily Star assessed it. Some in Boston concurred: a local columnist declared that the Garden hadn’t seen a brawl so wild since October 15, 1950. This time, for Boston, the win cost them centreman Dave Creighton, whose fibula broke under duress from Leaf defenceman Fern Flaman. Toronto captain Teeder Kennedy, 27, was gunning, in the parlance, for his 200th NHL goal. He’d have to wait. In the second period, he met up with his Boston counterpart, Milt Schmidt, at the Toronto blueline, and what the Star called a fracas ensued. While Schmidt punched Kennedy’s face, Boston’s Leo Labine and Warren Godfrey wrestled Leafs Jimmy Thomson and Ron Stewart, respectively. The powerful Bruins’ leader, with a half-swing, half-flip, threw Kennedy to the ice. Ted’s head hit the ice and he was knocked cold. Back in Toronto next morning, this all showed up on the paper’s front page. Suffering from a broken collarbone and torn ligaments as well as a “slight” concussion, Kennedy was said to be ruled out for at least five weeks. Creighton was gone, the thinking was, for the rest of the season. While the Leafs headed back to Toronto on the train, Kennedy rested in hospital. Kennedy, who didn’t drink, downed the brandy they gave him there (“made me woozy,” he said later) before flying home next day to Toronto for surgery in the company of the team’s own Dr. Hugh Smythe, and Mrs. Smythe, too. Doreen Kennedy was on hand to meet her husband’s plane when it landed at Malton Airport. Even with a stopover in Buffalo, the flight beat the Leaf-laden locomotive back to Toronto by half-an-hour. Kennedy sported a cast on his shoulder, and a slight bump on the head, under his fedora. The captain was the third Leafs’ center to go down, joining Max Bentley (lower back strain or, as one report put it, “twisted spine”) and Rudy Migay (torn knee ligaments) on the sidelines. Kennedy didn’t think his absence would affect the team’s playoff hopes. “We have other players,” he said. He was right about that, but wrong about the playoffs: for the first time in seven years, the Leafs would end the regular season on the outside looking in. Back in Boston, Milt Schmidt was giving the local Daily Globe a slightly different version of events from the one Toronto readers were seeing. The truth? It was all Tim Horton’s fault. 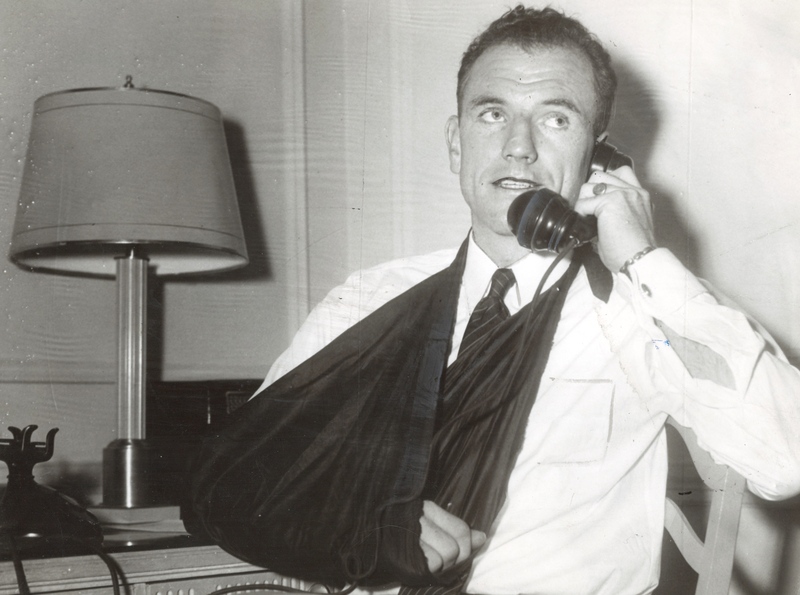 “He hit me with his elbow and I went back at him,” was Schmidt’s version of how he and Kennedy had come to blows in the first place. Score settled, they’d separated. But before the peace could take hold, Horton, boisterous Leaf rookie, riled it all up again.